2012 Volkswagen CC review | What Car? 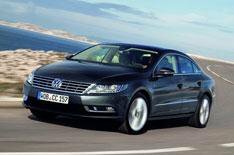 The Volkswagen CC is a face-lifted version Of the company's sleek four-door saloon, the Passat CC. As well as dropping the Passat part of the name, VW has updated the front and rear styling to bring the looks into line with the rest of its range. The V6 petrol engine has been dropped, but the other engines are carried over, so buyers can chose from turbocharged 1.8- and 2.0-litre petrols, and a pair of 2.0-litre diesels. Prices start at 24,200, which is a 570 hike over the Passat CC's. Whats the 2012 VW CC like to drive? We tried the 168bhp diesel engine, and this is a strong and flexible performer thats generally smooth and quiet. Unfortunately, the suspension tends to clonk over bumps and some wind noise builds up around the sides of the car at motorway speeds. GT-spec CCs like our test car come with Adaptive Chassis Control (its an 800 option on cheaper models), which lets you switch between three suspension settings, but the differences are subtle and the system doesnt change the fundamental character of the car. Even in the softest setting, body roll is well controlled and the handling is safe and secure, if not as sporty as the styling suggests. The ride can be unsettled on patched urban roads, but the CC is a comfortable motorway cruiser. Whats the 2012 VW CC like inside? The dashboard is simple to use, and while interior quality isnt up to Audi and BMW standards, most of the materials look and feel reasonably classy. The most significant change for the new car is that it has five seats, whereas the Passat CC had only four. Theres loads of space up front, but six-footers might find their heads touch the roof in the rear. A long boot, with a big storage well beneath, is supplemented by easy-to-fold rear seatbacks. The VW CC is a stylish and interesting alternative to mainstream family cars. However, the 168bhp diesel model that we drove is priced from 28,620, which places it too close to prestige saloons such as the brilliant BMW 3 Series. The 2.0 TDI 140 model makes more sense at 25,525, although it still carries a hefty premium over a Passat with the same engine and attracts a higher company car tax rating.